The MetroTaifun automatic waste collection system by MariMatic works like a giant vacuum cleaner. Waste collection and disposal is a major global health problem in this age. The rising global population precipitates a corresponding rise in the demand for food as well as other essentials. Consequently, we are generating more waste than we have ever generated in our entire history. It’s hard to argue that there is a dire need for innovative ways to collect and dispose of the waste generated if the environment is to be preserved. 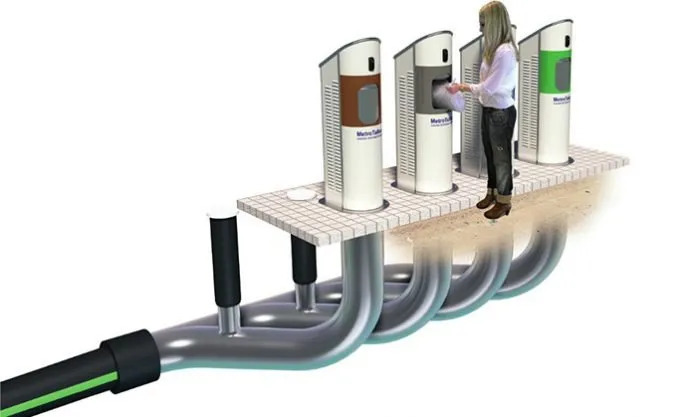 The Metro Taifun is a novel waste collection technology that works like a giant vacuum cleaner. The technology simplifies the process of waste collection through the use of underground or overhead pipes that may extend up to 4 km. This innovation greatly simplifies the process of waste collection and allows for healthy waste disposal by qualified companies. Like every other modern waste collection system, Metro Taifun also employs a clear waste sorting system. The typical Metro Taifun waste disposal system consists of four stands, one each for biological, mixed, paper, and cardboard wastes. The waste collection stands are closed systems, eliminating the usual mess that characterizes the prevalent waste bins. Each system can be locked and opened with the use of a keycard-like device. This prevents unrestricted access to the waste disposal system. The waste collected is vacuumed into a central waste collection point where it would be disposed of or recycled as appropriate. Asides public waste disposal stands, Metro Taifun can also be customized to suit the needs of high-rise buildings, hospitals, shopping centers, arenas, etc. The Metro Taifun is ideal for collecting waste from residential, commercial, or public buildings. There are large and medium systems that have been specially designed to cater to the unique needs of various facilities. You may opt for whatever suits your facility after assessing the amount of waste generated. Requires less air volume. This translates to smaller equipment and reduced costs. There is little info about the current price of a Metro Taifun system. You may visit the official website in order to make inquiries.